Dissociative Identity Disorder is a mental illness. It is characterized by the fragmentation and building up of one or many secondary characters other than the one basic primary character. 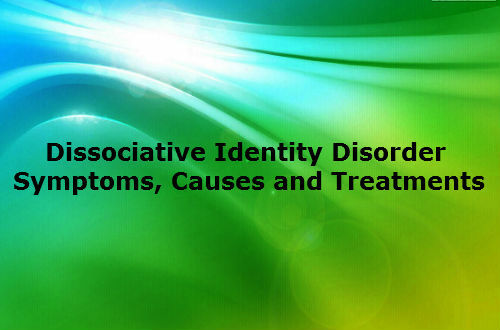 This disorder was also called as Multiple Personality Disorder until 1994. It is a serious condition in which the person loses his or her identity, has no knowledge of his age and gender, occupation and whatsoever of his personal information when the secondary characters take control of his mind. The information of the secondary characters have no relationship with that of the primary character and have their own personal history. A person affected by this trauma has severe headaches, mood swings, migraines and other neurological disorders. The secondary characters do not come forth suddenly but they are characterized by any stressful or any deliberating conditions. These secondary characters often acknowledge the existence of the primary characters but not always because they consider themselves the sole owners of the body. People living with ones affected by this disorder have to be pitied because they cannot be able to cope with them. It results from the medical conditions also. That is it also results from the side effects of any medicines that we take to cure any disease. As of now there is no treatment for this disorder because it may sometimes get worse in such a way that the person may commit suicide or harm themselves. It is very hard for to convince the secondary character that it is not real but only an imagination of the primary one. The person may have experienced any ill treatment, abuses like alcohol abuse or sexual abuse, and any desire that cannot be fulfilled by the primary character. So in order to calm the mind the primary character, without its knowledge develops a secondary character of its own to counteract the underlying desires of the primary mind. Though a very rare disorder it is should not be neglected. The loss in memory associated with this disorder is difficult to explain in terms of normal forgetfulness. The person experiences headache, trauma, stress, migraine and other neurological disorders. The person becomes susceptible to addictive of drugs and alcohol. The person develops problems of amnesia, sleep disorders, parkinson’s disease and violence. The person experiences more than one personality splits each with its own perception of the world, surroundings, environment and the lifestyle issues. About more than two personalities till the maximum of hundred secondary characters are diagnosed. At least two or three secondary characters repeatedly take control of the mind and each exhibits its own traits, name, behaviours and a name. Transitions from one secondary character to another takes place. This is brought about by psychological stress. Sometimes the characters deny the existence of one another, be critical of one and be in conflict with one another. The people have memory gaps. That is the dominant or the primary characters have more memory or knowledge than the secondary or less frequent ones. Some traits like guilt, passiveness, dependence and stress may be found. Behavioural problems and loss of presence of mind are also noticed. Aggression and self destructive behaviours are also diagnosed. Hallucinations due to visionary or auditory functions also occur. Loss of mind stability which leads to loss in importance in society and family. The exact reasons for people developing this disorder is not known. Some speculate that these may be due to the physical and psychological stress experienced during childhood. It is disputed but it is grounded on the factitious evidences. The folks with this disorder get flashbacks of the lost memories in the form of nightmares, shocks and startlers. To the person who has a biologically close relative affected by this disorder, has the chances of being affected by this trauma also. It was once considered rare but now it is reported often. As more and more persons are being affected by this trauma, the diagnosis of it also becomes complex. Sometimes the treatments themselves make the conditions more complex than the before condition. So the medical world has now become more cautious in treating the patients affected by this trauma. The society is to be blamed at large for the people to get affected by this disorder. The people in order to satisfy their greedy whims always do not think of truth, justice and do not hesitate to commit injustice. The people affected will develop this trauma over a period of years and seek to rid the earth of this heinous crime. They then resort to develop an individual or secondary character on their own to satisfy their very desires and eventually after the secondary character has been created their mind does it for them. But it is to be pitied because they do not come to know about it that is their primary characters do not come to know about it. The treatment of this disorder is not successful to the maximum desired capability. Sometimes the symptoms like headache, migraine, low concentration of the disorder may be examined and mistaken to be the symptoms for the other problems. The disorders will go untreated and the exact problem will be left. So the doctors study the individual’s history, medical records and the symptoms in order to bet a clear picture of the problem. If the underlying problems are found to be that of multiple personality disorder then the patient is referred to go to a psychiatrist. The psychiatrist then suggests no invasive procedures. Rather the patients are advised to practice meditation and have a deep sleep. Sometimes the secondary character gets into action because of any issue. So the people are advised to refrain from watching or hearing them. Some patients respond well to the treatments while some exhibit violent actions. The secondary character are convinced that they are not real but only the imaginative recreational revenants of the primary ones. Patients are also administered with anti-depressant, tranquilizers, sleep tablets and anti-anxiety drugs. Despite all these medications the patients will not be cured but the condition will only linger on.